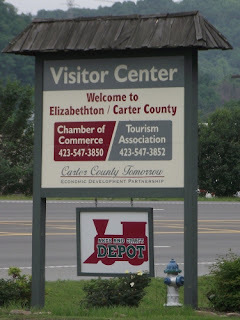 One of the most informative stops we made was to the Visitor Center for Elizabethton and Carter County. The brochures were as helpful as the staff. Best of all, a neat gift shop took up almost a third of the building. All the gift shop items were produced locally. I found an interesting handcrafted walking stick. On it is carved the face of a stylized old man. The photos of the stick haven't worked out too well. I've not given up yet. Inside the gift shop there were sewn items, soaps and other things and a few games. You'll have to explore the center when you're in Elizabethton to see what you can buy. There is plenty to tempt you. 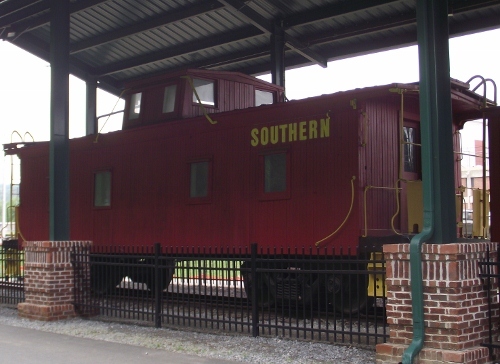 The visitor center grounds are on an old trail depot. Be sure to walk around the display. 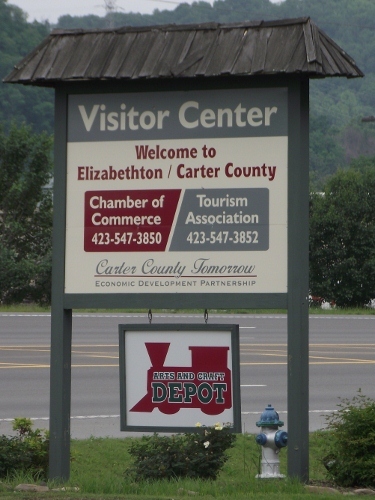 You can't miss it and may even see it before you see the sign for the visitor center in Elizabethton. I'm as glad that the gift shop was available as Hubby was to see the trains. The two complimented each other nicely and worked out well for us. I've not seen one of these since requiring them was dropped years ago. I wonder if the kids that are growing up now will ever see a caboose in action. Seeing this one brought back memories of waving at the conductors as the train passed by. Thank goodness for museums that keep history alive! This exhibit that the Elizabethton / Carter County Visitor Center makes it possible for all of us to be reminded of the grand ole' days. Trains are woven into the fabric of the U.S. In addition to providing transportation trains delivered vital materials. Last working commercial locomotive in the U.S.
Below is a shot of the train engine (and Hubby). He tells me that this was one of the last working train steam locomotives in Tennessee. It was used by the North American Rayon Company until 1992. According to Hubby, photographing this steam train was almost as much fun as taking an excursion would be. If you are in Elizabethton, TN be sure to stop by and see it. The exhibit is available even if the visitor center is closed for the day. Be sure to bring extra camera batteries and a large memory card.